Jasmin is a track and road cyclist hailing from beautiful Vancouver, BC but with unmistakable European roots due to growing up in small village in Northwestern Germany. After being plagued by overuse injuries throughout high school while dabbling in distance running, she turned to cycling as means to stay fit during college. Fortunately she was a much more talented cyclist than her previously mediocre sporting ventures suggested and immediately fell in love with the idea of being able to push longer, further, and faster. When not riding Jasmin is typically found on her yoga mat or whipping up a storm in the kitchen. She is now in her third year with TWENTY20. Turning her focus on the road this season before returning to the track in preparation for the 2020 Olympic Games. 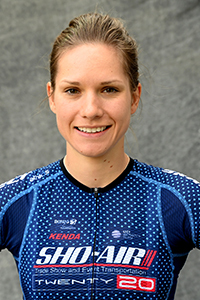 An all-around rider on the road and is including a few mountain bike races into her program this year. Currently working on completing a Master of Arts in Teaching. Being able to continually challenge myself. My fellow Canadian athletes, both past and present, inspire me with their dedication to excellence. I am fortunate to have so many role models in sport that push me to become the best person I can on and off the bike. Have raced UCI track, road, mountain bike, and cross races! Bend, OR and Redlands, CA. Bend because of the mountains and Redlands because its close to home. At home and on BC’s North Shore. I am terrible at most sports but fiercely competitive. Challenge me to any game involving hand-eye coordination at your own risk. I also have a vegetable garden. I don’t listen to music before racing.